You can support the Choir and enjoy preferential treatment by becoming a Friend or Patron. The majority of arts-based charities depend on voluntary financial support. Our singing members pay an annual subscription which roughly covers our overheads but income from the sale of tickets is rarely enough to cover the cost of hiring the concert hall and paying for the orchestra and soloists. By becoming a Friend or Patron you can help us to close the funding gap and at the same time receive a guaranteed preferential choice of a “best seat in the house” for our Autumn, Christmas and Spring and Summer concerts. 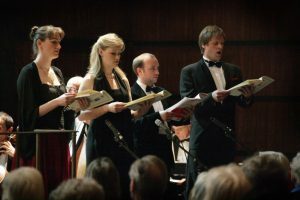 Friends and Patrons also receive periodic Newsletters, are invited to attend choir members’ social events and are eligible to have their names printed in concert programmes. Friends are currently asked to pay a minimum of £70 a year to receive all the benefits listed above. This amounts to only a few pounds more than the price of the best seat for all three concerts, but in most cases also allows the Society to claim a Gift Aid refund from HM Revenue and Customs. Patrons are those supporters who feel they would like to donate a little more than the basic Friends subscription. Silver Patrons are those who make a contribution between £100 and £200, whilst those contributing over £200 are classed as Gold Patrons. Gold Patrons receive two free tickets rather than one. We do hope that anyone who regularly attends the Choir’s concerts and values the contribution that it makes to music in Tunbridge Wells, will consider becoming a Friend or Patron, or by simply making a donation. The Royal Tunbridge Wells Choral Society is a charity and donations can be treated as gift aid for tax purposes. Details of our charity registration can be viewed here.